James begins by giving her readers an in-depth look at what it means to be a widow and a barren woman in Old Testament times, a heart-wrenching reality for both Naomi and Ruth. Her treatment on barrenness is particularly full of insight as she describes how God uses pain to engage his people on a deeper level, while also making it clear that the pain of loss can never be glossed over. She writes, "Even when we can pinpoint 'something good' that came out of tragedy, it never balances out what we have lost . . . No, the balance sheet always comes up short when we try to confine God in some delicate balancing act . . . We live in the realm of faith, and that means trusting God for who he is and not because things equal out or we have satisfying answers to our questions. Faith may want answers, but somehow it is able to survive without them" (p. 84). This is a poignant truth with which every believer can identify and with which every heart needs to be reconciled. James also helps us grasp the meaning of the Hebrew concept of hesed—God's loving kindness toward us and our need for this same kind of loving kindness toward one another. This, James writes, is the driving force of the book of Ruth. And we, as readers, have to constantly push back our tendency of thinking that Ruth is nothing more than a love story in which all the decisions and actions by the characters are motivated by ardor. This is not the case. James helps us to peel back the layers of presumption about this story to reveal the surprising, heart-stopping message that God desires to tell us: even in the midst of the depths of immobilizing despair, he is still there, and he has not taken away his hesed. In fact, through the eyes of Naomi, we are taught to understand that "he delivers a fresh supply of hesed every morning" (p. 121). In addition to this profound analysis, James' revelation of God's love toward women is a beautiful message, seamlessly interwoven into the description of God's heart laid out in the book of Ruth. A woman's significance and value is based on her high calling to be an ezer, which is a rescuer­warrior, and an image-bearer of the Creator, and nothing can take that away from her. Widowed and childless, Ruth and Naomi might have been given up as lost, but God saw them differently. James reminds us that, quite the contrary, "God's purposes for humanity are riding on the shoulders of two women the world believes have lost their ability to contribute" (p. 79). He has a plan for them to be great change agents for him, and, amazingly, they are able to fulfill that call from the depths of their pain. Through this reading of Ruth, James demonstrates that even if women are barren or left behind as widows, "The significance of their contributions in advancing God's redemptive purposes goes well beyond the eventual reversal of their barrenness and birthing of important sons. In these deeply personal struggles, God was shaping souls, equipping his daughters for greater kingdom responsibilities, and revealing facets of his character that . . . were illumined by their barrenness. From the depths of their denied longings for a child, these women emerge as wise teachers for God's people" (p. 80). Truly, the most striking message from James' book is that Ruth is not just a lonely woman, in the way of modern romance movies, seeking love and matrimony to complete her happiness. Marriage is not the ultimate goal. Instead, Ruth is a courageous woman, whose mission is to fulfill her vow to show hesed toward Naomi—even if it means breaking gender expectations. This is the great kindness that is spoken of in Ruth 3:10—a great kindness which is echoed in kind by Naomi and then Boaz, and culminates in a phenomenally world-changing, eternity-impacting royal family line. Talk about effective change agents! 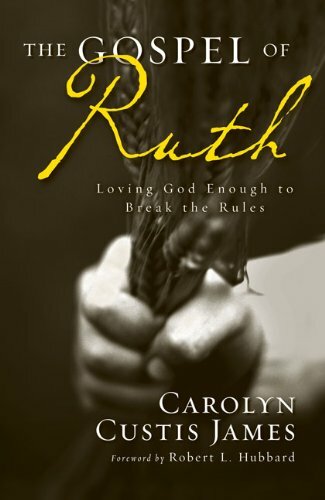 Indescribably, The Gospel of Ruth moved me on a deep heart level, and I highly recommend it to all Christian women and men.